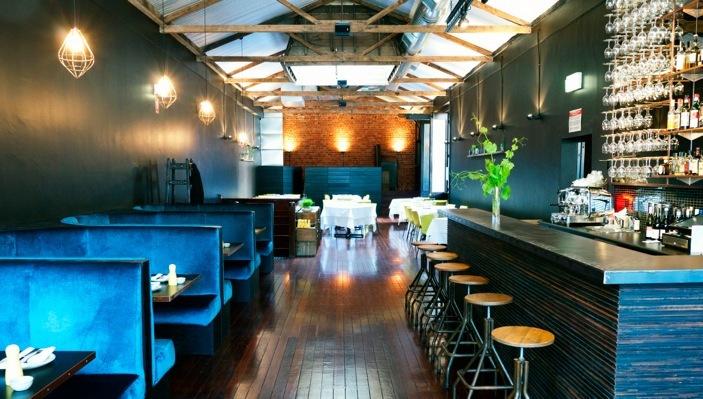 Even four years after opening, Press* Food and Wine’s double storey occupancy continues to be packed to the rafters every lunch and dinner service. Nestled in the heart of Adelaide’s CBD on Waymouth Street, Press* has been cleverly converted to take advantage of its vast space and soaring ceilings. The ground floor eatery has more of a casual feel about it and is designed for walk ins, while the light flooded room upstairs is more of a formal dining experience where bookings are strictly recommended. The upstairs dining room is a beautiful space, managing to blend both rustic and contemporary features together harmoniously to give it a modern, yet homely feel. Tables are dressed elegantly with impossibly crisp white tablecloths accompanied by contemporary yellow chairs while a woodshed/barn style feel with its wooden beams and exposed brick walls. The menu, created by head chef Andrew Davies (ex Bistro Dom), is neatly divided into small and large plates, which are designed to share. What’s most impressive however, is the restaurant’s focus on unconventional dishes – they even have a whole section devoted to offal. With a paddock to plate philosophy in mind, the menu reflects the changing seasons, with distinct Modern Australian and Asian influences. When it comes to curing, pickling, brining and smoking, practically everything is made in-house. When asking the waiter for recommendations, the response is “everything is good” – a confident reply but doesn’t help us with the decisions. After all, everything on the menu looks good. The sample tasting menu at $68 is great value if you’re feeling hungry and showcases the best dishes from all sections of the menu. We started with a generous serve of wood fired baguette, served warm which allows the wholesome house churned butter to ooze into it effortlessly. 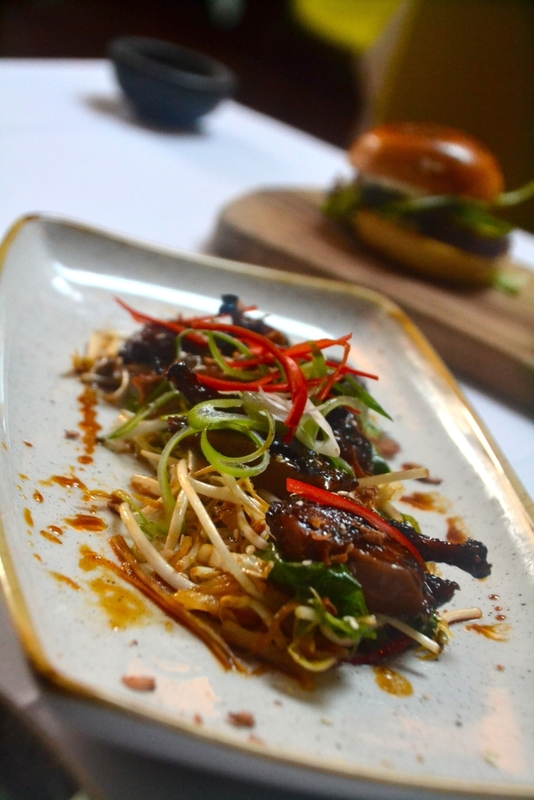 From the smaller plates, the spiced rubbed quail ($26) was a standout dish, igniting the senses with its sticky golden glaze, punctuated by both sweet and sour notes. Still on the bone in segments, the quail was beautifully cooked with a succulent flesh. An elegant bed of daikon and green beans was a nice accompaniment to the quail, providing the dish with a nice textural contrast and a light peppery punch from the daikon. A duo of Chinese style pork buns ($9.50 each) were a tasty assembly of brioche, lettuce, kewpie and a generous slice of roasted belly of pork farmed in the Flinders Ranges. 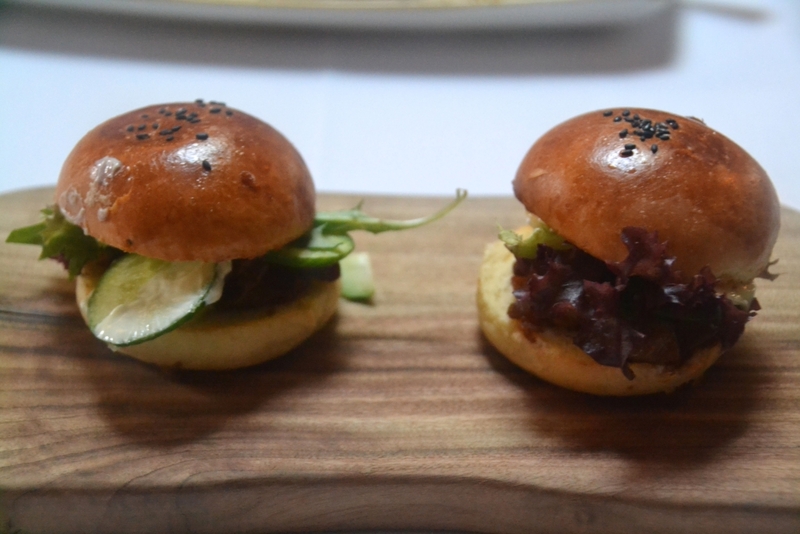 The picture perfect brioche bun had an airy consistency and a golden, shiny crown topped with black sesames. Despite its light consistency, the brioche held its integrity brilliantly. Kewpie (a Japanese style mayonnaise) brought together the elements of the dish perfectly, providing a touch of moisture and a herby flavour punch. 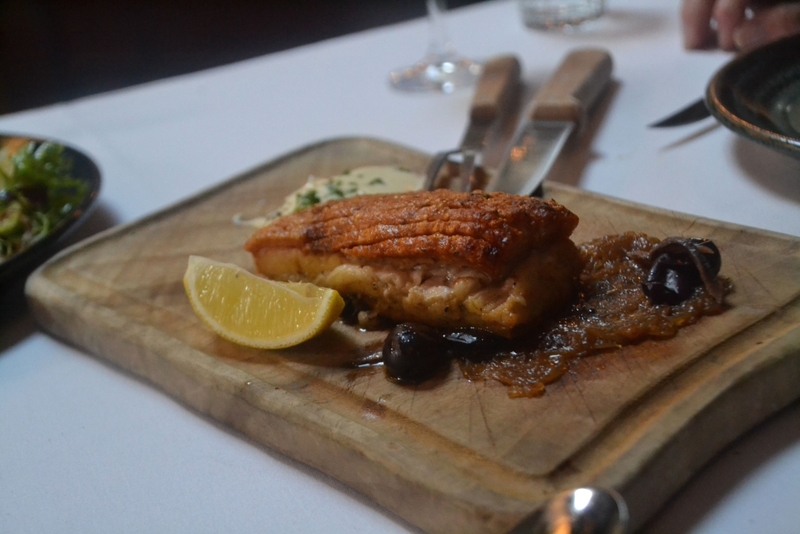 A generous slab of roasted pork belly ($24), teamed with olives, anchovy and confit onion was equally decadent. The ultimate test of a good pork belly is the crackling – and in this instance Press* passed the test with flying colours. Each mouthful of the melt in your mouth style pork ended with a satisfying crunch from the impossibly crisp crackling. The addition of olives and anchovies made the dish a little too salty for my liking, but the sweetness of the slow cooked onions helped to offset the saltiness ever so slightly. 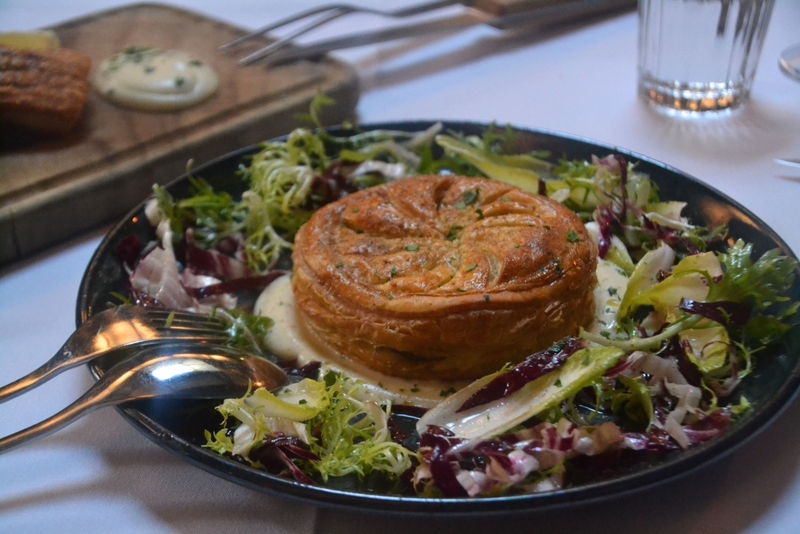 The truffled mushroom and taleggio pithivier ($24), was a handsome dish with a distinctive sunbeam pattern scored on top. Encased in light, fluffy layers of buttery puff pastry, the pithivier was stuffed with creamy mushrooms and pungent taleggio. A shallow pool of cauliflower puree was a perfect partner to soak up the remaining pastry of the pithivier. With the help of quality restaurants like Press* Food and Wine, Adelaide is finally gaining some momentum in the restaurant stakes. The menu is a nice mix of classical versus contemporary – designed to keep the diner guessing. Davies dedication to fresh produce straight from the kitchen garden will continue to draw hungry punters in years to come. When it comes to sourcing the best of South Australian produce, from the patch to the plate, Press* Food and Wine is a force to be reckoned with.